To help you better describe your items, we're introducing a new rich text editor to our posting form. When you're posting an item, you can now format your description by using formatting buttons or by using HTML. 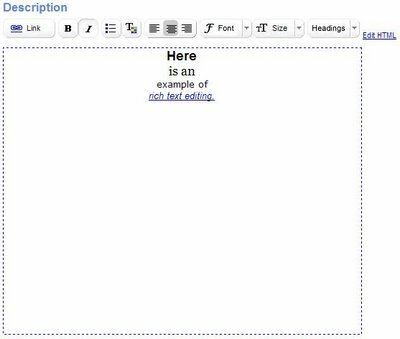 The rich text editor provides you with a toolbar containing the most frequently used formatting options, and supports all standard HTML tags. You can copy text from your browser and paste it into the editor, and the formatting will be retained. Thus you can easily reuse any HTML descriptions you already have on your site. You can also view and edit the HTML source directly, with an instant preview of your new description while editing. It's important to note, however, that at this time, we're not enabling any scripting, data input controls, or frames. Also, HTML descriptions are only available for single item posts.